Last weekend, a friend confided in me that he and his wife wanted to join a gym, but they were struggling with where to start—a dilemma shared by many. You may have found yourself in the same predicament, and it can put the brakes on living a healthy life. Joining a gym or starting any fitness routine, like yoga, running, cycling, dancing, or swimming, is going to have a learning curve attached to it. Understanding this can help you stay confident and work through the early transition when you’re figuring things out. Everyone is a rookie at some point. So, here are my four tips that will help you stick to your fitness routine and get the most out of it. One of the first things that will aid your success with and adherence to a fitness routine is knowing what you want to achieve. This can also be extremely difficult. What I like to tell people is to look at the things they already enjoy doing. So, if you like to go outside for walks or find yourself dancing around the apartment, it makes sense to join a walking or running club, or to participate in fitness-based dance classes. After all, you’re doing it anyways. If there is something you’ve always been interested in and never tried, just give it a shot. I like to recommend sticking with your choice for at least two months before you decide on whether to continue. Remember, there’s a learning curve. Observing the atmosphere is also important for adherence. Being somewhere that’s inviting and comfortable will almost definitely make the time you spend exercising more enjoyable. Some things to consider are the other people occupying the space, available equipment, classes offered, and employee attitudes. If it’s a class or a gym, I also recommend looking for facilities that offer programs for people of varying levels of development—beginner, intermediate, advanced. So, making sure you’re in the right space is essential. If you’re looking to get involved at a gym or fitness facility, I highly recommend hiring a trainer. But, there are some things you’ll want to pay attention to. Most gyms have a roster of trainers and how they’re assigned is almost like going to a deli counter. Your number gets called, and the next available one comes to help. But, it’s entirely possible this person won’t be the right fit for you. What you can do to make sure you get the right trainer is to spend an hour or so for a day or two in the gym and observe the different trainers in action. Watch how they talk to their clients. Are they helpful, engaged, and appear to be listening to their concerns? 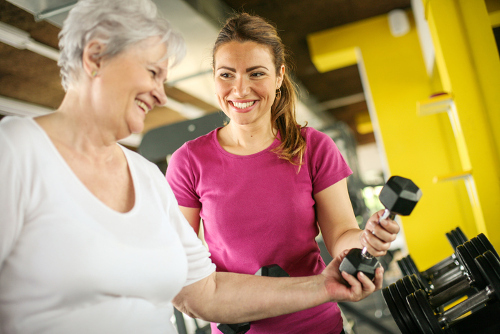 Asking a trainer if they are certified and have experience working with clients of your age group and fitness level is also recommended. This will be a big bonus because they’ll know how to design a program that’s targeted to your goals and needs. Also, don’t let them do all the talking. It’s important the trainer knows what you enjoy, what you’d like to accomplish, and how you want to get there. If you sit down and they’re not asking questions and seem more focused on telling and selling, you should speak to someone else! Lastly, try not to make too many changes at once. Taking on too much too quickly will almost always result in trouble. If your long-term goals are regular exercise and a healthy diet, implement them incrementally. Start with exercising a couple of times per week. Then gradually add in more activity, so that you develop a routine. And, when that’s accomplished, look at your next goal and move in on it slowly. When it comes to building a healthy lifestyle, there is no sense sprinting out of the gate. Phasing in elements slowly and steadily makes the transition more natural and sustainable.